If you have the curves, flaunt your assets no matter what your body shape. 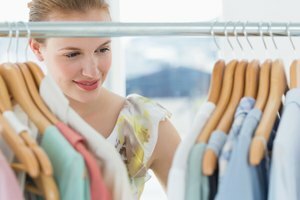 Shop your closet from a new perspective by identifying your particular body shape and then pairing tops and bottoms that enhance your best features and draw attention away from areas you want to conceal or diminish. Two body shapes are similar -- hourglass and pear -- but a few quick measurements can confirm your shape. Create a new wave of fashion confidence as you mix and match your pieces using your body type as your guide. Taking time to measure your shoulders, bust, waist and hips, helps you determine how your body is proportioned. Ask a friend to wrap a flexible tape measure around the widest area of your shoulders. Continue with your bust, wrapping the tape around your back and across the widest part of your chest without squeezing. 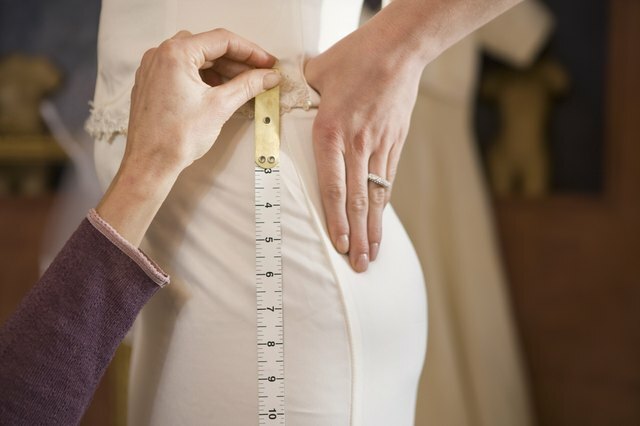 Finish by wrapping the tape around the thickest part of your waist and then the widest part of your hips for accurate waist and bottom measurements. Quick glances in the mirror can often reveal your body type. If your shoulders and hips are approximately the same width accompanied by an ample bust line and well-defined waistline, you have an hourglass body shape. As long as your measurements reveal that your shoulder and hip dimensions don't vary more than about 5 percent and your waist is about 25 percent smaller than your shoulder and hip measurements, you have an hourglass figure. Because your hourglass curves are in all the right places, look at your wardrobe through fresh eyes. Go for tops and layers that feature your small waist: cinching sweaters, wrap-style cardigans, V-neck dresses and tight, wide, bow belts. You can emphasize and elongate your torso wearing jackets, blazers and cardigans that finish along your hip line. Find that perfect pair of jeans by looking for bottoms with fitted waists and get rid of any with that annoying gape along the waistband because of your shapely curves. If your measurements reveal that your shoulder measurement is significantly smaller than your bottom measurement and your waist is 8 or more inches smaller than your hips, you have a pear-shaped figure. Your narrow shoulders and small waistline create a slender upper half that often appears long and lean. Generally, you carry your weight around your hip and thigh area. If you've found it a bit challenging shopping for the perfect summer short or fall pant, look for wide-legged or palazzo-style bottoms to slim your hips and thighs. Become inspired by borrowing styling tips from celebrities who use their pear-bottom asset to their fashion advantage. Put together looks that include flirty, flared bottoms and flowing A-line silhouettes. You can wear formfitting bottoms; just select darker shades than your top colors to create a balanced look. Light-colored tops shift attention upward, and dark bottoms camouflage and conceal the wider parts of your bottom and thighs. Wear a halter neckline top in a light gray paired with an A-line black skirt. Do a complete color reversal using silhouettes to shift the focus mixing a black sleeveless top in a slightly loose silhouette paired with a gray pouf-like skirt and black pumps. Blissfully Domestic: What Is Your Body Type?